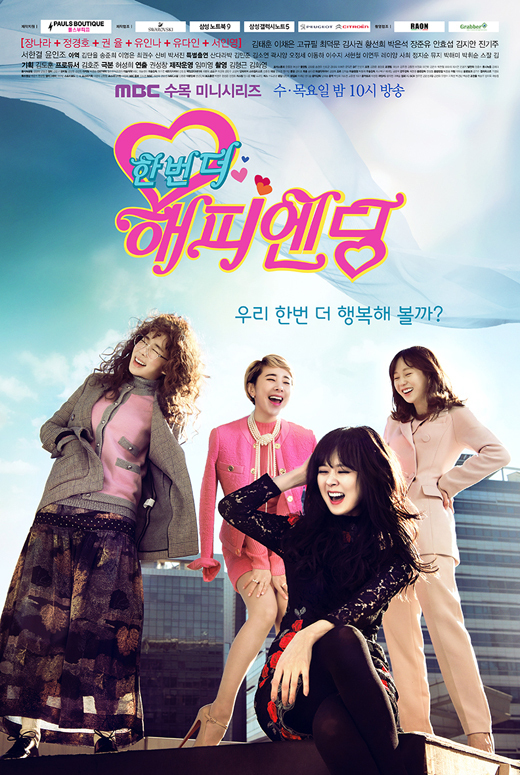 A romantic comedy about a once-popular first generation girl-group, whose members are in their 30s and are living very different lives, and the men they encounter as they fall in love once again. In the 1990s, Han Mi Mo (Jang Na Ra), Baek Da Jung (Yoo Da In), Go Dong Mi (Yoo In Na), Hong Ae Ran (Seo InYoung) and Goo Seul Ah (Sandara Park) were once members of the successful idol group “Angels". However, the group struggled internally due to Seul Ah's intolerable attitude and meanness, which was further aggravated by her being the most popular member. Fed up with Seul Ah's selfishness, Mi Mo got into a highly publicized physical fight with her and the group disbanded in 2003. Due to certain comments I expected One More Happy Ending to be a cliché, boring rom-com, since 2015 to 2016 is filled with those dramas. Plus, the fact that Jang Nara was the lead actress, really didn’t appeal to me. But here I am, writing a review to it. I got to say it took me by surprise. One More Happy Ending was a fun little ride. There is the wonderful friendship between four girls at the center of the drama. They are always there for each other as they work to overcome life’s challenges throughout adulthood. It was nice to see. It wasn’t all a pink cloudy ride, as there was some seriousness to it, since it dealt with divorcees, single-parenthood and a lot more. It wasn’t the perfect drama, since it felt into a loop a couple of times, but it did manage to pull out of it and ended with a nice feeling to it. BUT, a review is not a review if I don’t mention the lead actor, the one and only reason for me to have watched it. We finally get to the king of the show. You know what is amazing? How he managed, in a show that focuses on women, and had 4!! female leads, to rise above everyone and have the most important, interesting, touching, funny and adorable character of everyone. His acting could have been as forgettable as the other lead actor but he managed to own the show! True king!